Definining profile machinings and the creation of machining drawings is time-consuming? No longer! 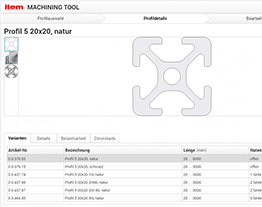 The item Machiningtool includes a profile finder, which finds easy and safe the right prolfile for your application. Interactive and intuitive 3D-technology enables you to mount fasteners and machinings at your aluminium profile – accurate to the very last millimeter.On the page “Result” you can check your project, make the decision to add fasteners and accessories to your shopping card. As a special highlight, you can create a complete 2D-machining drawing – automatically!